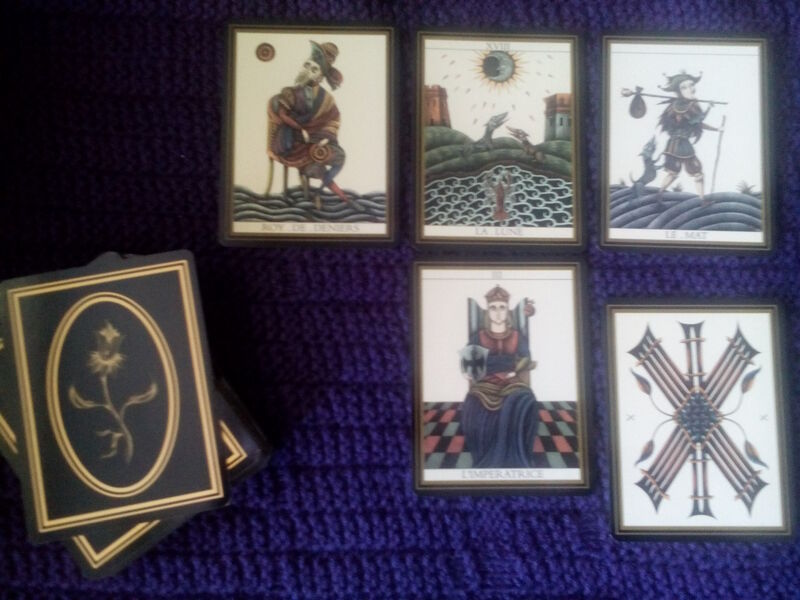 From Le Tarot Noir: The King of Pentacles, the Moon, the Fool, followed by the Empress, and the Ten of Swords. The King of Pentacles, the Moon, the Fool. The Empress. The Ten of Swords. I don’t know what you see here, but I see mental illness (the Moon) dividing a family. I see the Fool walking ahead bravely, faithfully on his or her path, while the King of Pentacles looks away, thinking of more practical matters, not wanting to see either the Fool or the path. This so often is what happens when one member of a family faces a mental illness, such as severe depression, alone. Is there a solution? Only the same solution that so often helps us to overcome all sorts of energetic blocks: truth. Facing the issue head on, like the way the Empress (who I drew as an advice card here) looks at us. The Ten of Swords — melodrama! — is likely to arise in the course of this revelation. In other words, it won’t be easy. Everyone seems to end up feeling sorry for themselves at some point in the course of this story. But that’s okay, if we can at least neutralize the judgements. Not everyone understands how everyone else feels. Not everyone understands everyone else’s motivations or even their general situations. We don’t always — do we ever? — have all the pieces of the puzzle. So it’s best to refrain from judgement and simply address the energy of the situation with honesty. Not looking away but looking AT the issue in question. 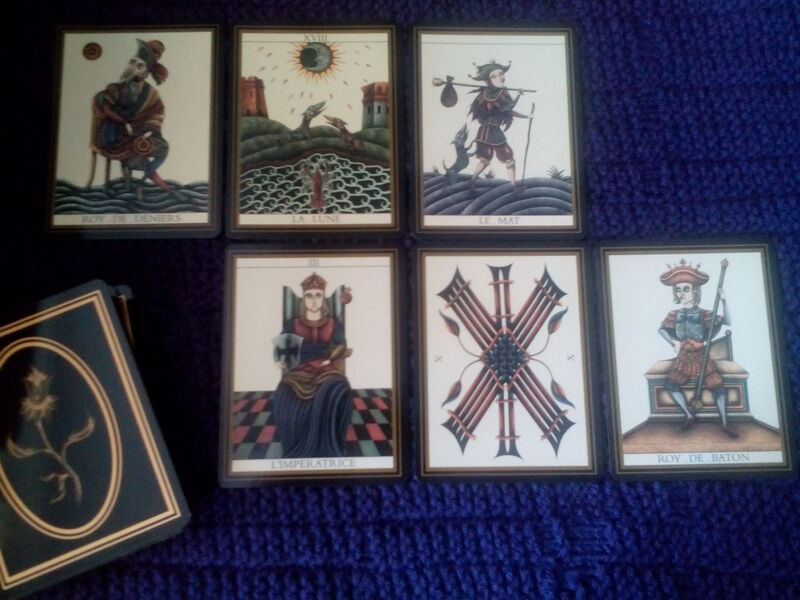 Same layout as above, with the King of Wands added as an Outcome. The King of Wands card here seems to me to be silent as to whether the family now understands. Some families will never understand no matter how much honesty you throw at them. Because they won’t turn their heads and look to see the thing that you’re shining your light on. But honesty can still heal your end of the relationship. And the family may turn their heads yet, even if they do not do so right away. It’s almost impossible that they won’t turn their heads and look, given that they are almost certain to feel the Fool (now the King of Wands) staring straight at them!